"Great news if you are a big talker and have an iPhone on the AT&T network. 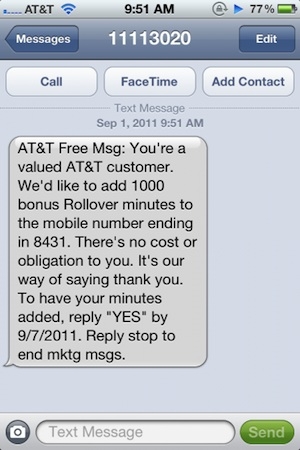 AT&T has started sending out text messages offering you 1000 free rollover minutes. All you have to do is reply with the word "Yes" and the extra minutes will be added to your account." I tried this, and got back a message thanking me for responding and advising me they would send confirmation as soon as my account was validated. So who knows if it works, but it is worth a try.